The Philippine Embassy in Berlin, through the authorized appropriations under the General Appropriations Act, intends to apply the sum of Philippine Pesos Three Million, Seven Hundred Fifty Thousand (P3,750,000.00) only, being the Approved Budget for the Contract (ABC), to payments under the contract for the “Procurement of one (1) motor vehicle, sedan, with engine displacement of at least 2,900 cc, diesel-fueled, for official use of the Philippine Embassy in Berlin.” Bids received in excess of the ABC shall be automatically rejected at bid opening. One (1) Moter vehicle, sedan, with engine displacement of at least 2,900 cc diesel-fed. A complete set of Bidding Documents may be acquired by interested bidders from 12 September 2018 from Berlin-BAC Secretariat. 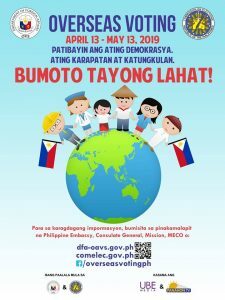 It may also be downloaded from the Philippine Embassy’s website at www.philippine-embassy.de. Bids must be delivered to and received by a designated member(s) of the BAC Secretariat at BAC Secretariat Room, 2nd Floor, Haus Cumberland, Kurfürstendamm 194, 10707 Berlin, on or before 26 September 2018, 12:00 noon. All bids must be accompanied by a bid security in any of the acceptable forms in the amount stated in Section 27.2 of the IRR of RA No. 9184. Bid Opening shall be on 26 September 2018, 2:00 p.m. at the Embassy Conference Room, 2nd Floor, Haus Cumberland, Kurfürstendamm 194, 10707 Berlin. Bids will be opened in the presence of the Bidders’ representatives who choose to attend at the address below. Late bids shall not be accepted.